After Saturday’s close battle with top 5-ranked Baylor, the Ole Miss men’s basketball team will be back in Southeastern Conference action on Tuesday (6:00 p.m., SECN) when the Rebels host in-state rival Mississippi State, who is coming off a 71-62 road loss at Alabama. Tuesday night will mark the 255th all-time meeting between the two schools in what is the SEC’s most played rivalry. The Rebels (12-9, 3-5 SEC) have won five of the last six meetings against the Bulldogs, including four straight in Oxford. MSU leads the series 142-112, but when the games are played in Oxford, Ole Miss has the edge, 82-43. In the loss to the Bears on Saturday, senior forward Sebastian Saiz notched his 14th double-double of the season, which leads the SEC and ranks him fifth nationally. Saiz and Terence Davis, last week’s SEC Player of the Week, were in foul trouble for much of the latter part of the game against the Bears. However, the emergence of freshman guard Breein Tyree gives the Rebels another scoring option, especially when Saiz gets doubled teamed. All three will need to have a solid game against the Bulldogs (13-7, 4-4) to help keep hopes alive for a possible berth in either the NCAA or NIT Tournament. Andy Kennedy saw freshman point guard Breein Tyree evolve as Ole Miss’ floor general in the Rebels’ 78-75 loss to Baylor on Saturday. 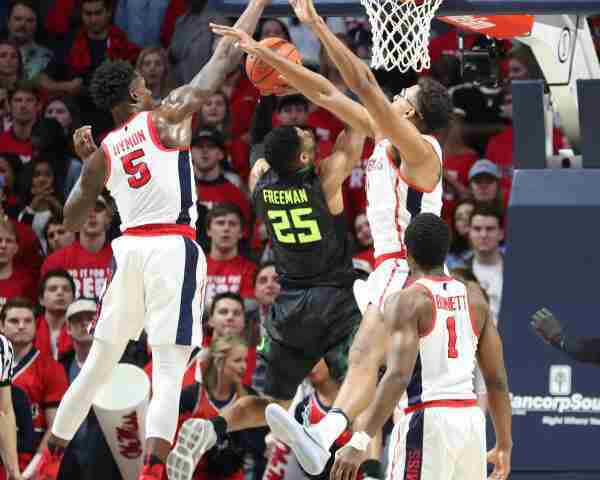 Tyree helped keep Ole Miss in the game when Terence Davis and Sebastian Saiz were in foul trouble late in the second half with the game still in reach. Davis fouled out, finishing with nine points, three rebounds, two assists, and two blocks. Saiz stayed on the floor, playing with four fouls. Tyree, who scored a career high 20 points against the Bears, made it clear he is not afraid to attack the basket. He committed only one turnover in 29 minutes of action. After the game, Tyree said his surgically repaired knee is no longer bothering him. Since Tyree’s knee is no longer an issue — and he’s obviously up to the challenge of playing at a high level in a big game — Kennedy should keep him in as the team’s starting point guard. In their last two games against Baylor and Texas A&M, the Rebels were outrebounded 76-50. If Ole Miss wants to beat Mississippi State, it must win the rebounding battle. The Bulldogs are not a good rebounding team, currently sitting at 13th in the SEC in rebounding at 34.8 rebounds per game and last in the league in rebounding margin in conference play at -4.8. Ole Miss is currently fifth in the SEC in rebounding (38.7 rpg). Mississippi State’s backcourt of sophomore guard Quinndary Weatherspoon and freshman guard Lamar Peters has been the main reason the Bulldogs have had success this season. Weatherspoon leads Mississippi State in scoring (17.6 ppg), field goal percentage (49.1), and 3-point percentage (43.5). Peters is second on the team in scoring (12.1 ppg) and has dished out a team-high 54 assists. If Ole Miss can find a way to limit Weatherspoon and Peters and force the Bulldogs’ frontcourt to score a bulk of the team’s points, the Rebels have a great chance of winning their second straight game over the Bulldogs in the series. Ole Miss and Mississippi State tip off at 6:00 p.m. (CT) in The Pavilion at Ole Miss. The game will be televised on SECN.